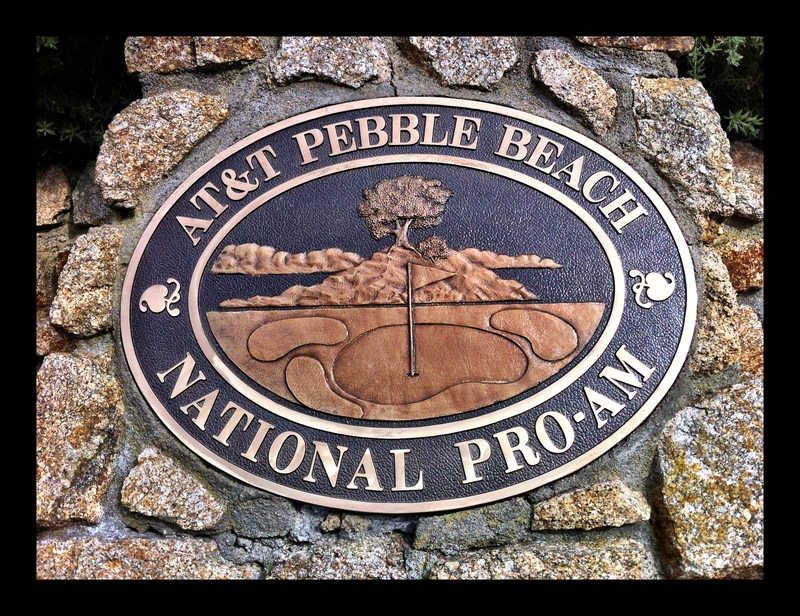 I had a wonderful opportunity to attend the 2013 AT&T Pebble Beach PRO-AM Golf Tournament during the practice session yesterday. 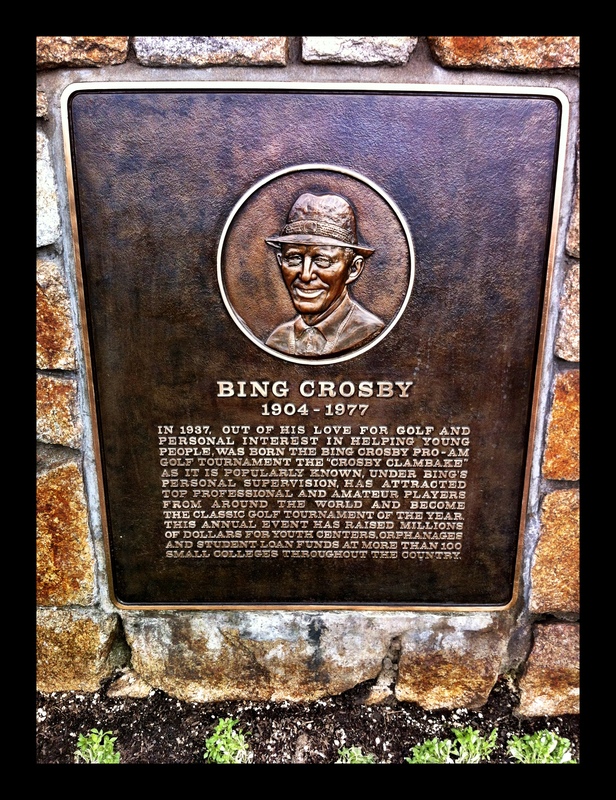 This was also called the “Crosby Clambake”, established by Bing Crosby out of his love for golf and his personal interest in helping young people. Due to my most excellent “tour-guide” I learned quite a bit about the tournament and golf. The combination of great company, stunning views, good food/drinks and some fun celebrity sightings made for a fabulous time. There is still time to watch the tournament as it runs from February 4-10, 2013. Monday – Wednesday they practiced (and the celebrities, aka amateurs, rubbed clubs with the pros.) Thursday – Sunday is the actual tournament. If you love golf, views, the ocean and good wine – this is for you. 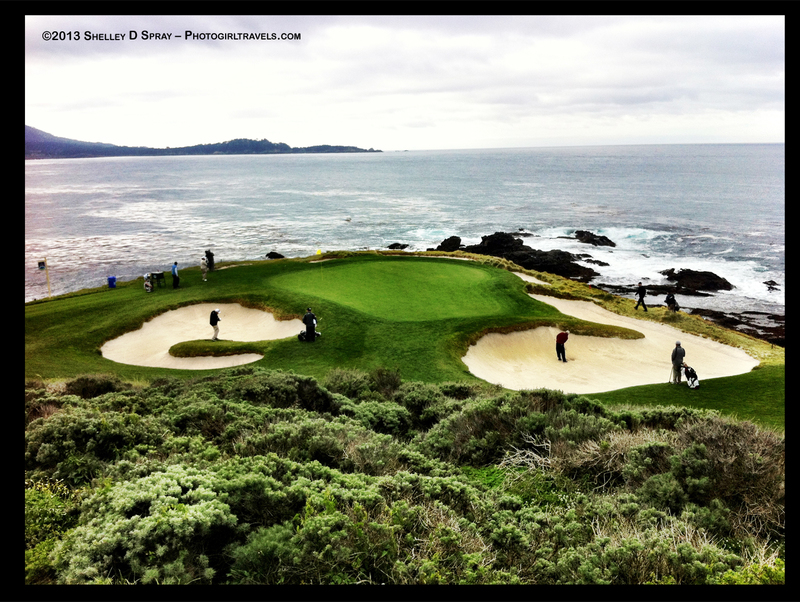 The longest hole at Pebble Beach is 14 (572 yards) That’s over 5 football fields long! The Bench: There are a number of places to eat, but I would recommend The Bench. 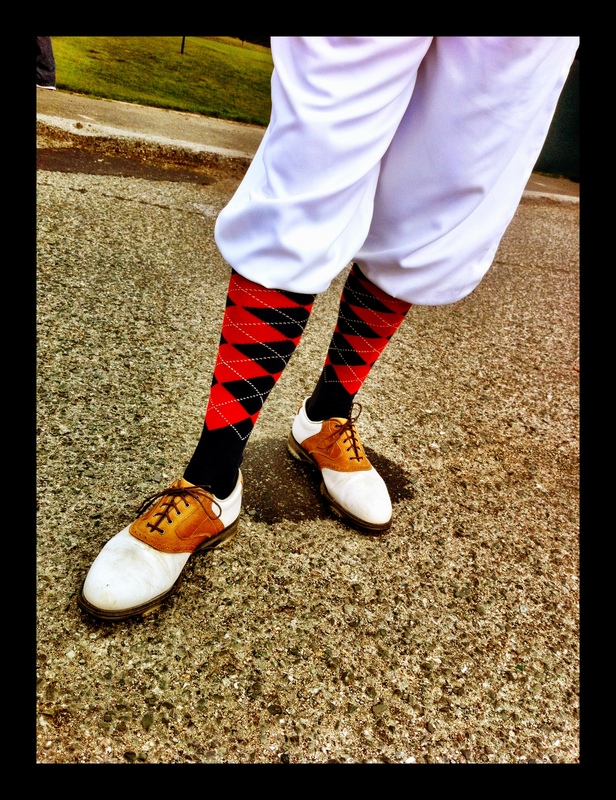 This is a hip and trendy bar/restaurant located by the 18th hole. You can sit by the fire, sip a glass of wine, have lunch and people watch. 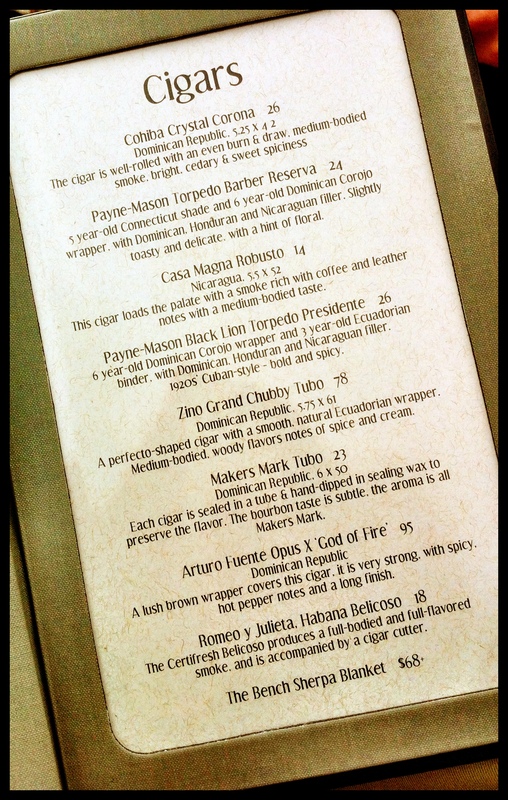 But that’s not all, if you’re looking for a good cigar; they have a fairly impressive menu (With one priced at almost $100. I think I’d try to find a way to wear it at that price). 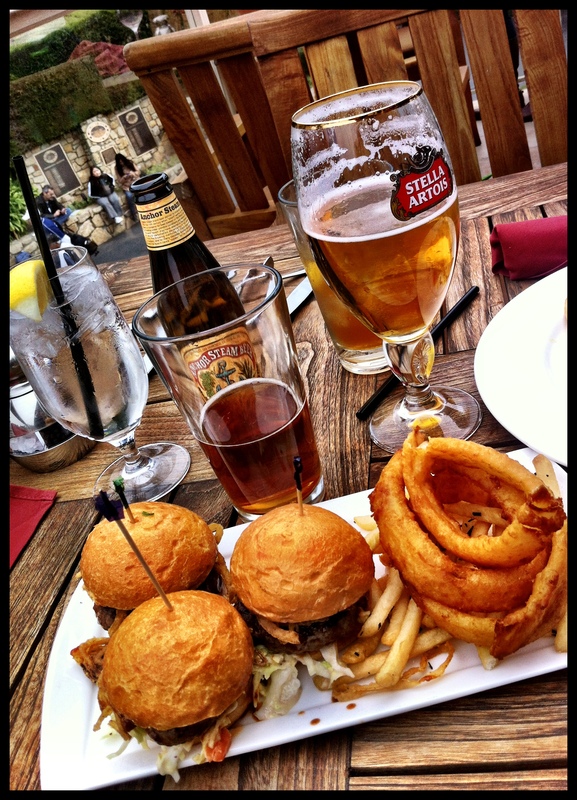 Quick tip – They’ll give you a bar menu but if you want to eat a great bacon burger, ask for their lunch or dinner menu. 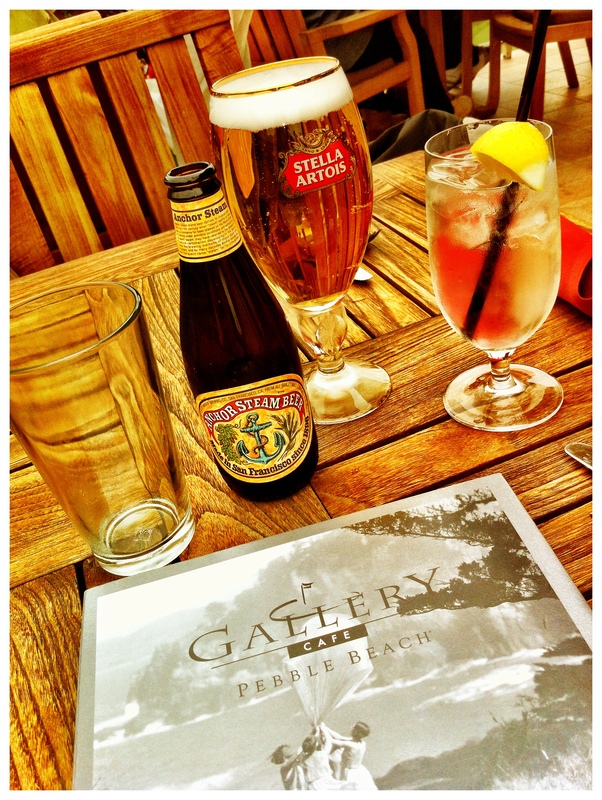 Gallery Café: If you eat outside at the Gallery you can watch the Pros practice their putting. You’ll also have a birds-eye view as they hit off the first tee. 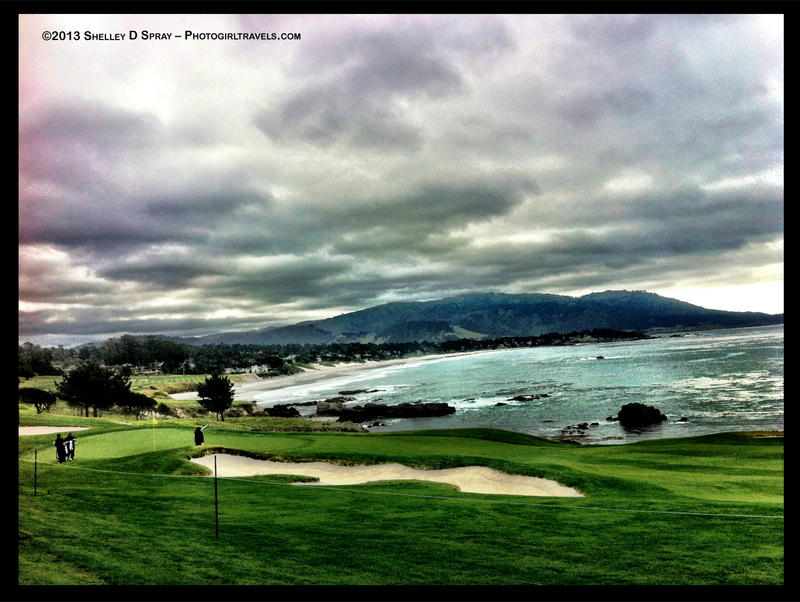 So you can start planning early, here’s a map of Pebble Beach. (#7 is my favorite hole. It’s a tough par 3 as the green is perched out on a ledge, overlooking the water.) No worries if you decide to do this by yourself. Believe me, you won’t be alone! Would you like a print? Please click on “Contact”. My photography is printed on aluminum. Utilizing an advanced process which infuses dyes directly into the metal, the colors and saturation are really amazing. In addition, your print will be displayed using mount blocks which float the image ½ inch off the wall. ©2013 Shelley D Spray – No content on this site (including all photography) may be reused in any fashion without written permission from the author. Categories: GOLF | Tags: Aaron Rodgers, Andy Garcia, Andy Roddick, AT&T, at&t pebble beach national pro am, beach, Billy Murray, Bing Crosby, Brandt Snedeker, bunker, California, Carson Daly, Chevron, Chris O’Donnell, David Duval, Dustin Johnson, fore, golf, golf ball, Hunter Mahan, Jim Furyk, Josh Duhamel, Justin Verlander, Lee Westwood, Matt Cain, Mike Weir and celebrities and sports stars: Wayne Gretzky, northern california, Pebble Beach, Phil Mickelson, Ray Romano, San Francisco 49ers, San Francisco Giants, tee, Tony Romo, Vijay Singh, Webb Simpson | Permalink.